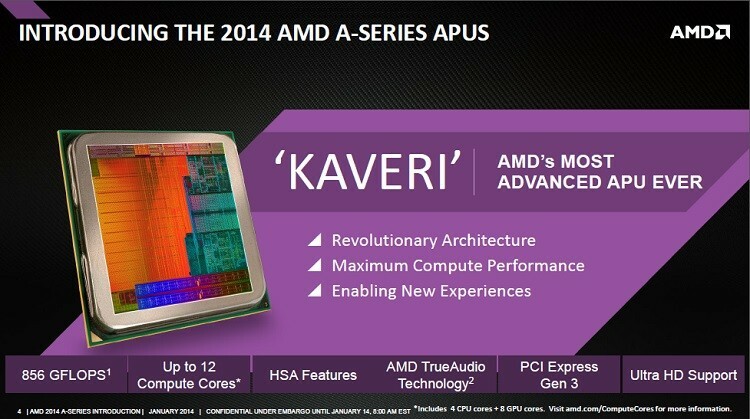 AMD has officially taken the wraps off their brand new range of APUs, codenamed 'Kaveri'. As the successor to last year's Richland APUs, Kaveri includes new CPU cores based on AMD's 'Steamroller' architecture, plus a Radeon R7 series GPU integrated onto the die. Starting with the CPU, Kaveri will feature up to four x86-64 cores clocked as high as 3.7 GHz, pushing up to 4 GHz as part of the APU's Turbo mode. AMD claims Steamroller is 10% faster than the last-generation architecture ('Piledriver') per-clock and per-core. But the best aspect of Kaveri is the improved GPU, which includes up to eight GCN compute units (512 stream processors, 32 TMUs) and clock speeds as high as 720 MHz. This Radeon R7-branded on-die GPU in the flagship A10-7850K makes the APU significantly faster than Intel's 'Haswell' Core i5-4670K with HD 4600 graphics in a number of benchmarks, according to AMD. The company also claims that 35% of Steam users have GPUs slower than the flagship Kaveri chip, and that its on-die GPU is a better option than an Intel GPU with entry-level dedicated graphics. One of the more interesting slides that AMD provided details the performance of Kaveri versus Haswell with a dedicated Radeon R9 270X graphics card. Kaveri appears to match or perform slightly under Haswell in many of the games listed, which if priced under Intel's offering could be a very competitive option for gamers. Kaveri naturally supports TrueAudio and Mantle, and AMD has provided some figures to go with it. In an Oxide Games demo Mantle provided up to 3x greater performance on a Kaveri APU versus DirectX, but more importantly gamers could see up to 45% better performance in Battlefield 4 with a high-end Radeon GPU. Ultra HD resolutions are supported by Kaveri, but don't expect fantastic in-game results. To start with, AMD are launching three Kaveri SKUs: the A10-7850K, A10-7700K and A8-7600. The flagship 7850K comes with four CPU cores at 3.7 GHz plus the full eight GPU CUs; the 7700K has four cores clocked at 3.4 GHz plus six GPU CUs; and the 7600 has four 3.3 GHz CPU cores plus six GPU CUs. All chips come with 4 MB of L3 cache, a GPU clock speed of 720 MHz and configurable TDPs ranging from 45 to 95 watts. Both the A10-7850K and A10-7700K will come bundled with Origin keys for Battlefield 4 in the box, and meet the minimum system requirements for the game. It's still unclear exactly how much these APUs will cost, but it won't be too long before they're available at retailers.